This recipe was submitted by Karen Gilman, Registered Holistic Nutritionist™ helping families whose children are vegetarian. Have you tried moo shu before? The traditional moo shu usually consists of pork that’s cooked with scrambled eggs, sesame oil, mushrooms, ginger, garlic, soy and rice wine vinegar, which definitely seems simple and healthy enough. But, since we don’t normally eat a lot of pork, this Vegetarian Moo Shu recipe with shiitake mushrooms, cabbage, raw veggies, and a delicious home made hoisin sauce is the perfect alternative to a delicious classic. Also, a more conventional version uses what are called Moo Shu Pancakes, which are tortilla-like wrappers that you wrap the pork and veggies in, so let’s make it colourful and completely plant based and wrap up this delightful little dish in collard greens, which, to us, hold just the right amount for a bite sized meal. 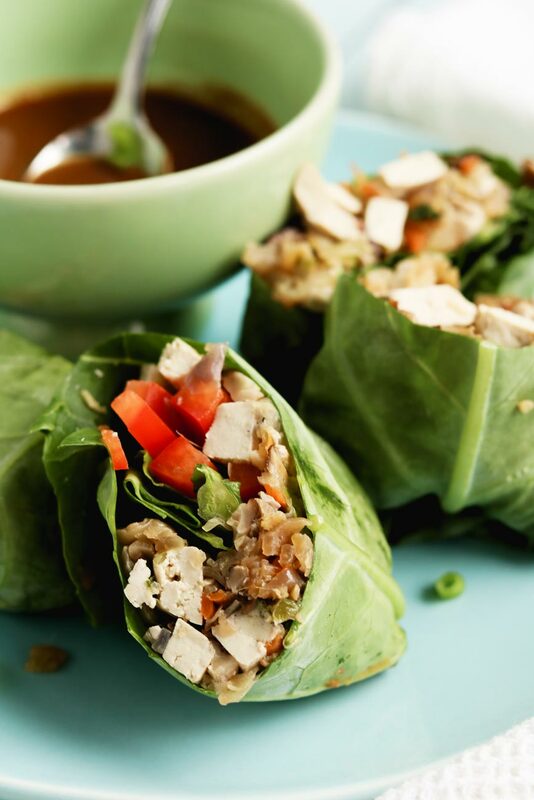 We’re digging these Vegtarian Moo Shu Wraps made with shiitake mushrooms, tofu, cabbage and a homemade hoisin sauce. 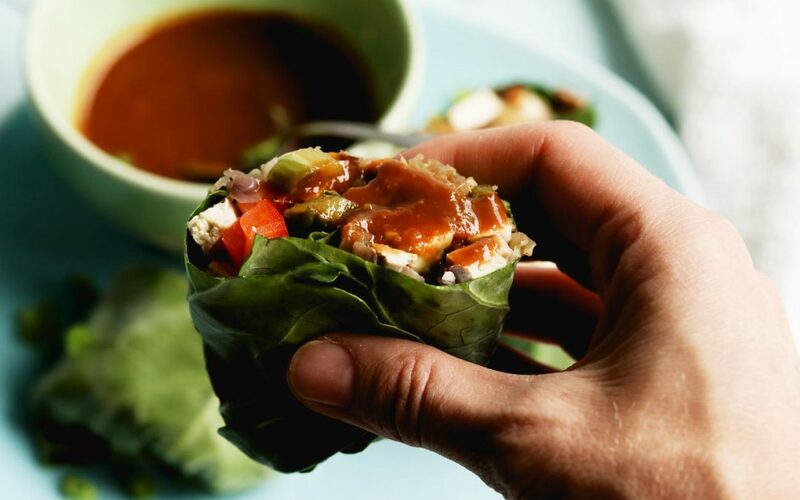 Not only are they loaded with plant-based ingredients, but creating a home made sauce instead of store-bought hoisin ensures that your ingredients are free from high amounts of sugar, preservatives and artificial ingredients. Also, have you ever used collard leaves to neatly package up your food? 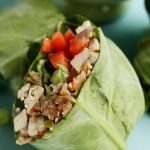 For these Vegtarian Moo Shu Wraps, you don’t need collard wraps, you can absolutely use rice paper wraps, Boston bibb lettuce, or even corn tortillas, but we love collard wraps for this these veggie moo shu wraps. Collards are part of the cruciferous veggie family, which are one of the most nutrient dense families of food in the world. Just 1 cup of collards contain over 100% of your daily intake of Vitamin K, they contain high amounts of chlorophyll, and the anti-oxidant called alpha-lipoic acid (ALA), which helps to lower blood glucose levels, and regenerate liver tissue. Talk about a healthy kick. 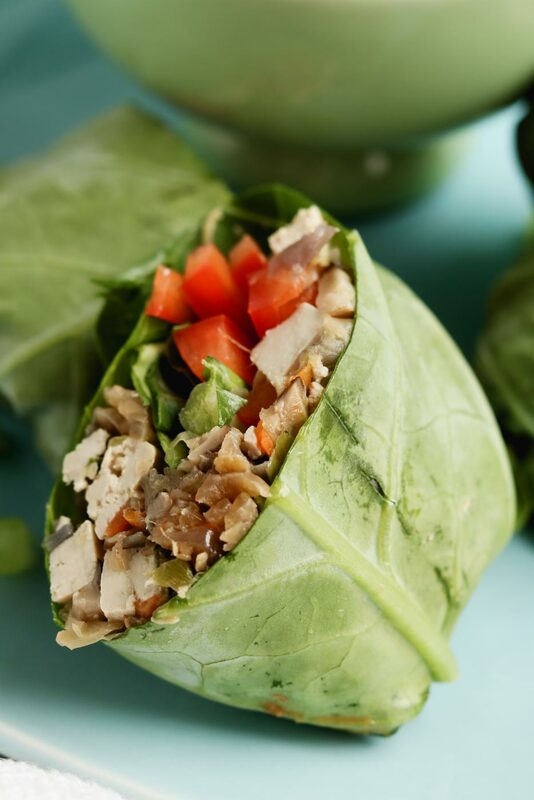 And, because we like a good grain-free, plant-based meal every now and then, collards are our perfect wrap for these delicious little vegetarian moo shu wraps. We’re digging this vegetarian moo shu wrap alternative, because it tastes amazing, contains a lot more nutrients than their pork-based counterpart. We usually try to fit in a healthy swap when we can, and because of that, we created a list of our favourite Healthy Food Swaps for you, so switching up your wheat, dairy, and sugar for much better alternatives can be really simple. Download your Healthy Food Swap List here. If you’re looking for another plant-based Asian inspired dish, like this vegetarian moo shu wrap recipe, this Chilled Buckwheat Noodle recipe is your new go-to noodle recipe that’s simple to put together as well! It’s loaded with veggies, a simple soy sauce and we love to top it with fried tempeh. 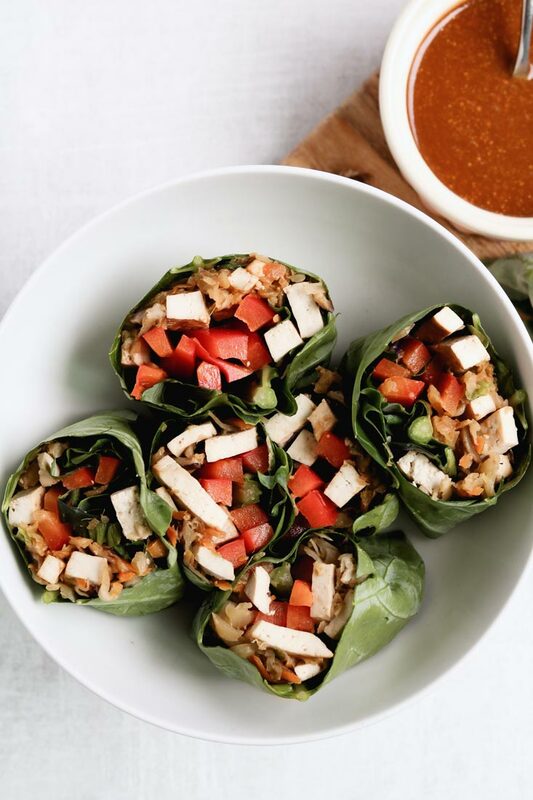 We’d love to hear your thoughts on this veggie moo shu wrap recipe. If you happen to whip it up for a healthy, plant-based meal, don’t forget to tag @naughtynutrition.co when you do. Pour the sesame oil into a large frying pan and cook garlic and ginger until soft. Add shiitake mushrooms and cook 3-4 minutes, until soft. Add cabbage and cook for another 4-5 minutes or until cabbage wilts. Add tofu and continue cooking. Stir in green onions. Add tamari and cook until warmed through. Meanwhile take all of your hoisin sauce ingredients and whisk them together until you have a sauce-like consistency. 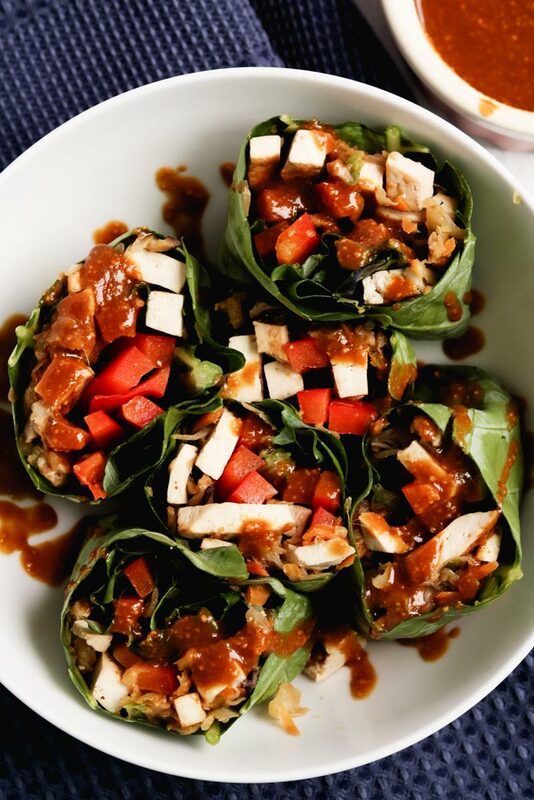 To serve, spread 1 tbsp hoisin sauce over lettuce. Top with a spoonful of cabbage/tofu mixture and roll. You can fry the tofu first, before cooking the rest of the veggie ingredients if you’d prefer the tofu to be crispier. Just add a bit of oil to a hot pan and cook each side of your tofu for about 5-7 minutes each side. *Choose low sodium tamari or soy sauce, or coconut aminos to cut the sodium of this dish by half. 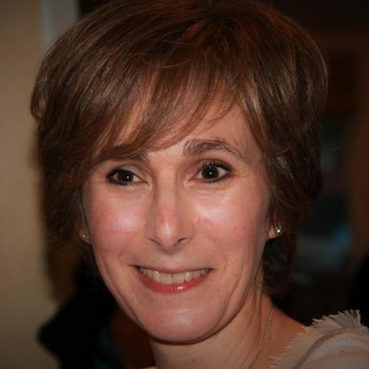 Karen Gilman is a Registered Holistic Nutritionist™ and mom to two teenage girls, one vegetarian, one not. For her, preparing vegetarian meals for the past 30 years coupled with the Diploma in Natural Nutrition from the Canadian School of Natural Nutrition, has provided her with the insight and tools to provide help to families whose children are vegetarian. As a mom, she knows the struggles with getting everyone to eat well. She loves cooking healthy meals and treats from scratch for her family. Sometimes they eat them, sometimes they don’t. As a Registered Holistic Nutritionist it is her role to support dietary and lifestyle changes your family can embrace. You can learn more about Karen's nutrition practice at http://www.nutrilicious.ca. Or check out her Facebook page here.